So let me tell you what Shorty and I have been up to lately. We’ve been busy making ice-cream. See the story goes that two of my friends Adrian and Eddie gave us an ice-cream maker as a wedding gift a few months ago. We’ve never had the chance to use it until well… in the midst of some soul-searching I suddenly developed the interest to try it out. You see in Thailand there’s a type of ice-cream I really like. It’s called Umm Milk and it’s a milk flavoured ice-cream that tastes like you’re eating Dutch lady milk powder (in a good way). But I’ve never seen this milk flavored ice-cream anywhere else in KL. In fact I don’t see many options for ice-cream in KL apart from Haagen and Baskin. Baskin of course being the one with the most variety of flavours and my favourite of the two. There’s a lot of Frozen Yoghurt stores in KL now but I don’t really like Froyo. I heard too that it’s not as healthy as people make it out to be and I believe that if you wanna have ice-cream, go all the way or don’t do it at all. So one day I decided that we should do it. The machine came with a recipe booklet and we also Googled for some other recipes and tried our hand at making ice-cream. The first one we ever made was Nutella ice-cream. It was horrible. I don’t want to show the picture here because I’m pretty ashamed of it. Haha. But today I made my milk flavoured ice-cream and it’s YUMMY! Not as good as Umm Milk yet but I think we’re on the right track. Just have to do a bit of trial and error. The thing I love about ice-cream is that it’s such a happy thing. Can you ever imagine anyone holding an ice-cream cone looking angry? 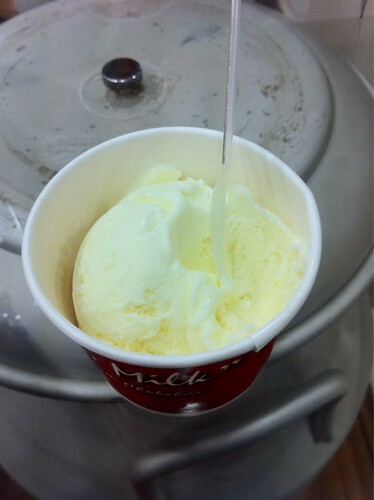 When we make ice-cream, I feel as if we’re making happiness in a bowl. To then pass it on. Maybe one day Shorty and I will start a small ice-cream store that sells this happiness. It’s probably really hard to make money as a business but hey as long as it doesn’t lose us money… why not sell a bit of happiness? Now we’re looking for more flavours to try out. What’s your favourite ice-cream flavour that you can’t seem to get in KL?